(8 bags) Quikrete Concrete Mix 80 lbs. Post Hole Digger *Optional* You can rent a machine. (8 quantity) Scrap boards to brace your posts when you put them in the ground. We used extra 2x3s we had lying around, but you can use anything that’s long enough. Once you have all of the materials you need, you are ready to begin. First, we have to give you the mandatory warnings. Anytime you plan on building, you should check the building codes in your area to make sure you don’t need a permit. Also, since you will be digging, make sure to contact your utility companies to make sure you won’t hit any water or electrical lines. With that out of the way, lets get started! 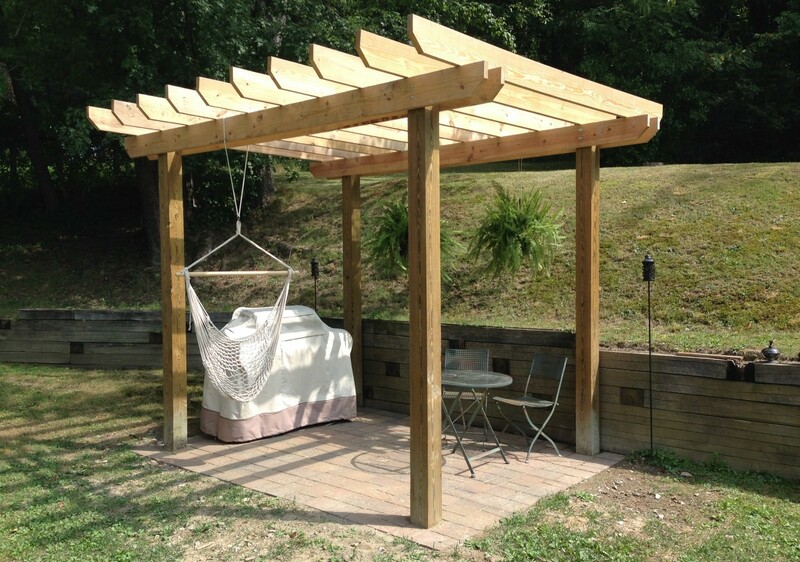 Start off by deciding where you want your pergola to be and then measure out your area. For this walk-through, we are measuring out an 8-foot x 10-foot area. Put some stakes into the ground where you want the posts to go and then tie some strings from stake to stake in order to give us our guidelines. Be sure to measure diagonally from corner to corner of your guideline to make sure the distance from the corners are the same. This ensures you are squared up correctly. 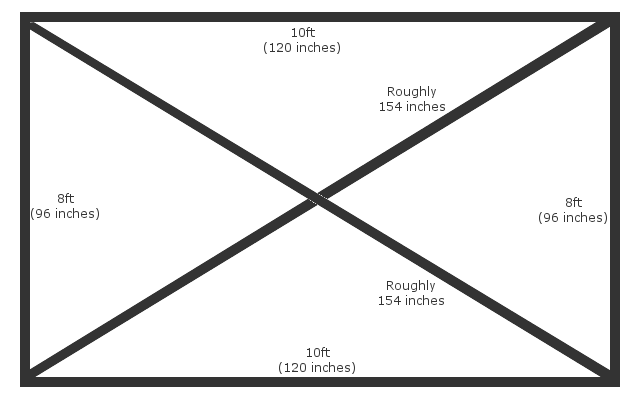 For an 8×10 layout, both diagonals should measure roughly 154 inches. If you need to make minor adjustments so that the diagonal corners are the same length, do that now before you start digging. Now that you have your guidelines in place. You are ready to dig your post holes. You can do this by renting a post hole auger from your local home improvement store, or you can do it the old fashioned way with a post hole digger and tamping rod. Either way works fine. You will need to dig 4 holes within your guideline at each corner. Dig each hole to a depth of 3 feet. 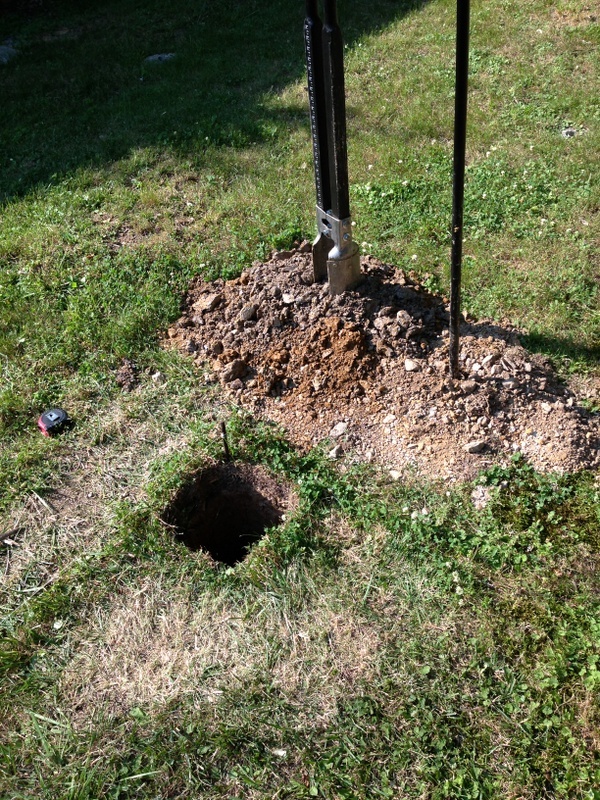 Once you have your holes dug, you are ready to set your posts. 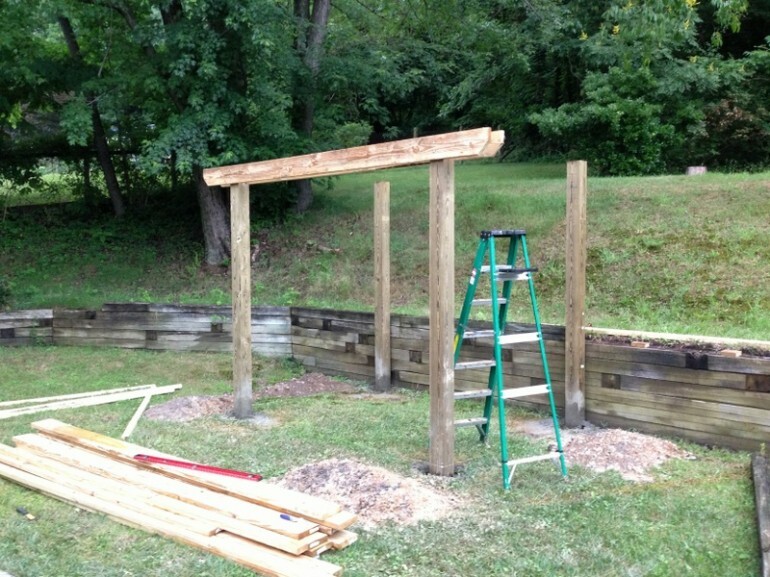 Put a 6x6x12 beam into each of the 3-foot holes you have just finished. 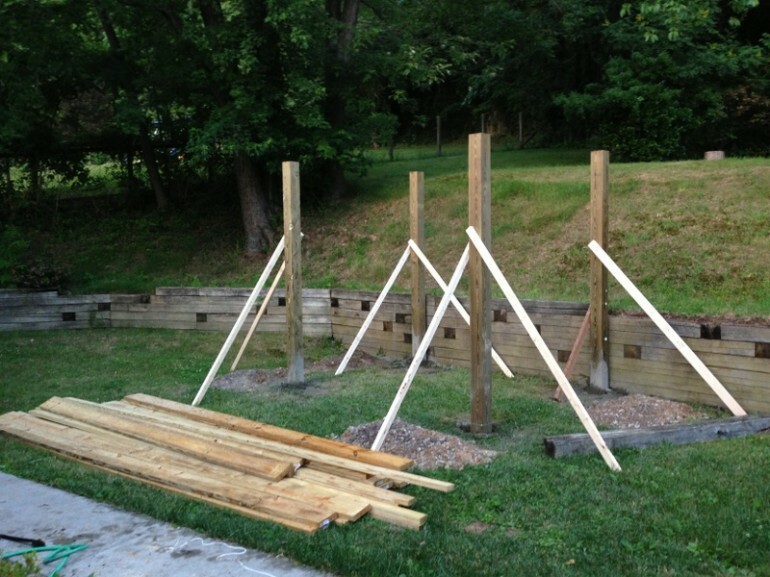 Once you have all of your beams in place, you will need to level and brace them. 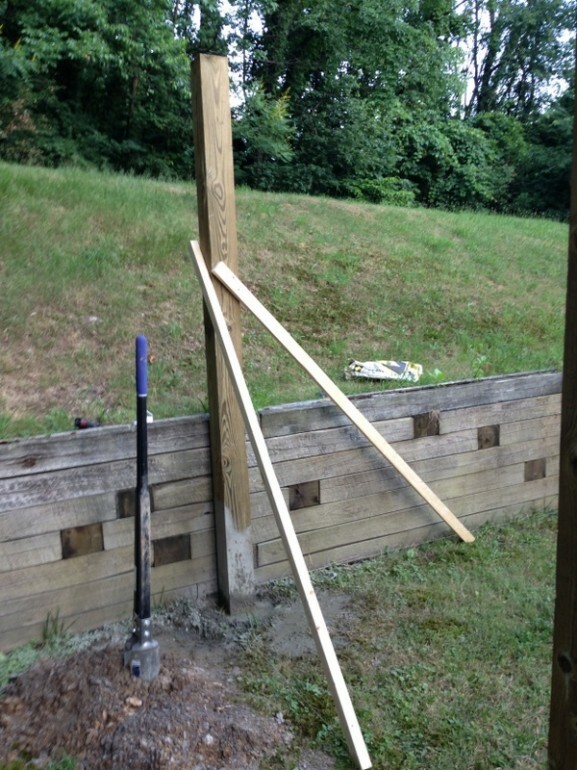 Screw a spare board into your beam about halfway up and let the other end of the spare board brace your post from the ground. Do this for the other side as well. Now hold your level to your beam and see what adjustments need to be made. Once you maneuver your beam to be level, make sure the braces are pressed into the ground firmly and drill another screw into each brace to secure it in place on the beam. Check to see if you are still level and make adjustments as needed. Once you are level and your braces are in place, you are ready to add concrete. You will need to add 2 bags of concrete to each hole. 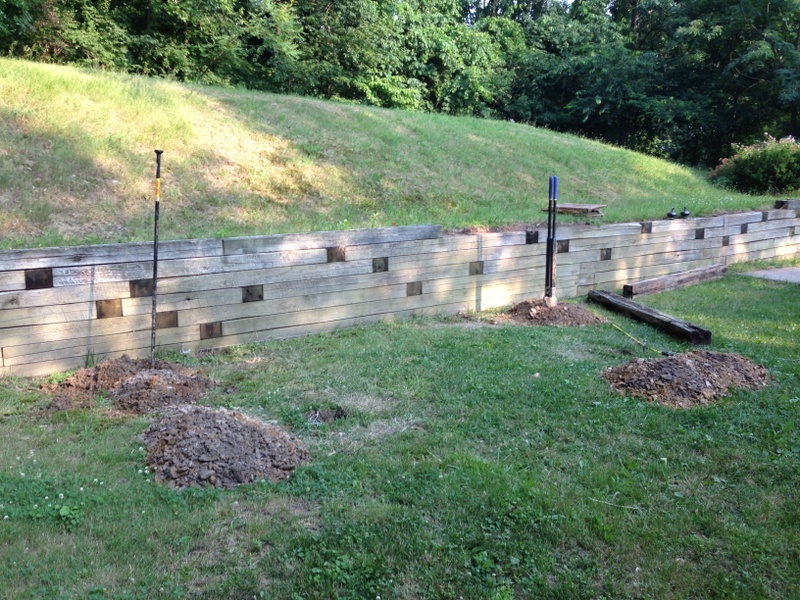 Once you have added the concrete, fill each hole with water and let it sit overnight. Now we are ready to cut our boards. First we will need to cut our girders (our four 2x8x16 boards) to the correct length. 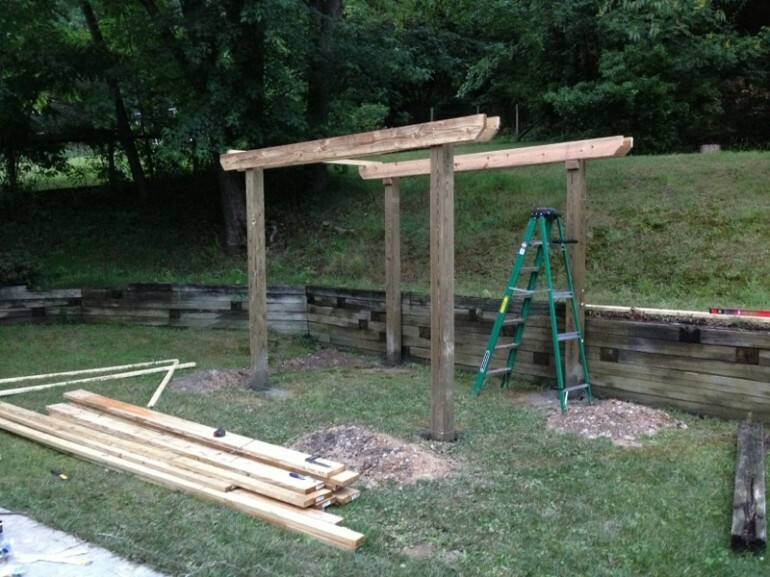 Measure the long sides of your pergola from the outside of each beam. 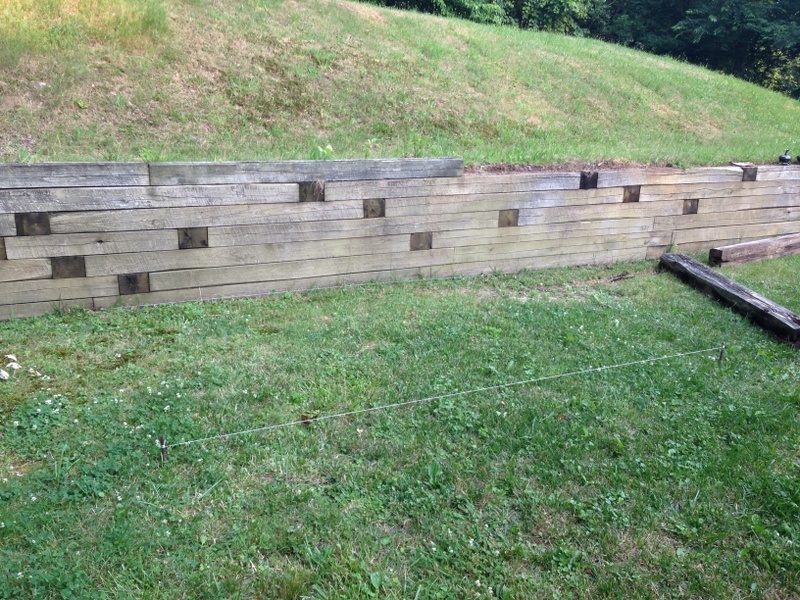 These are the sides that should be 10-feet (It’s okay if you didn’t get it dead on). Now add 36-inches to this measurement. The 36-inches will give us an 18-inch overhang on each end of the pergola. For example, let’s say we were at exactly 10-feet with our measurement. With the added 36-inches (3-feet), we would cut our 2x8x16 boards down to 13-feet exactly. Once you have your girders cut to length, we are ready to make our angle cut to the end of each board. 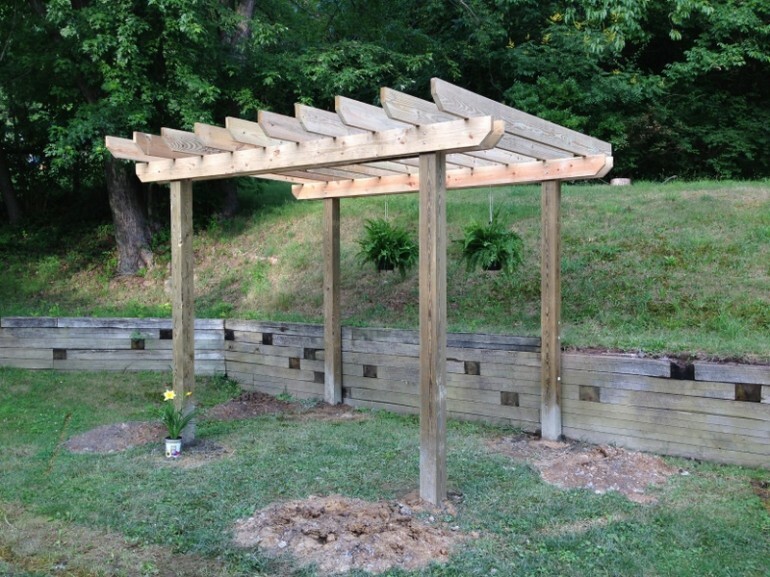 There are different designs you can cut for your pergola, but I believe a simple 45-degree cut looks great and is easy to do with a miter saw. Measure halfway down the end of each board (about 3 1/2 inches) and make your 45-degree cut using your miter saw. Do this to both ends of each board. Now make measure 18-inches in on each side and make a mark so that you know where to line up the overhangs with the beams. With all four of your girders cut to length and each end cut at a 45-degree angle, we are ready to put the girders in place. If you are by yourself this can be a little tricky. 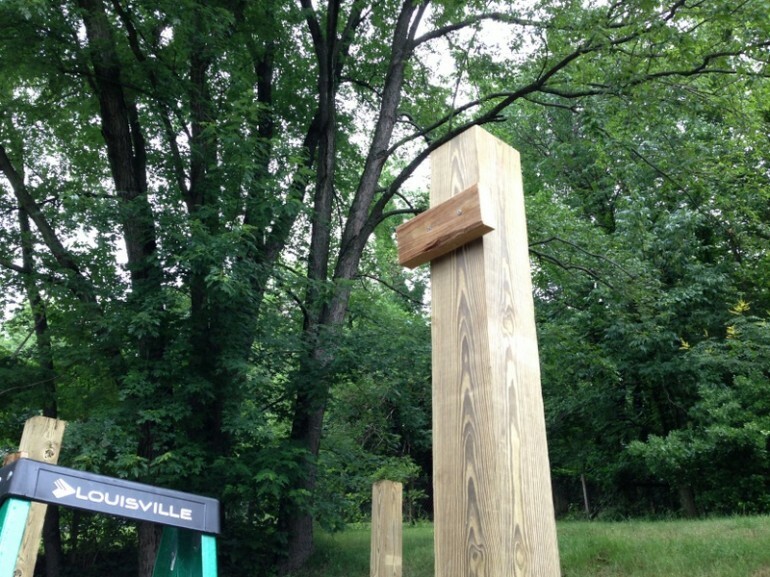 First, measure 6-inches down from the top of each beam and draw a line. Now screw a cleat to each of your beams just below this line. The cleat can be any spare piece of wood that you are going to use to hold one end of your girder while you secure the opposite end in place. It’s best to have someone to help; however, if you are alone, you can support one end of your girder on the cleat while you raise the other end to the top of the opposite side. Set the girder on the cleat, move it so that you match your 18-inch mark on the girder with the outside of the beam. Secure it with a couple of deck screws once you have it in place. Now check the other end. Your 18-inch mark on your girder should line up with the outside of the beam. If everything looks good, secure this end as well. Repeat this process on the other side of the beams. You should now have 2 girders in place and ready to be bolted to the beams. With both girders secured to your beams. Use your 3/8-inch Extended Drill Bit to drill two holes through each end. You will be drilling through the outside girder, the beam, and out the girder on the opposite side. 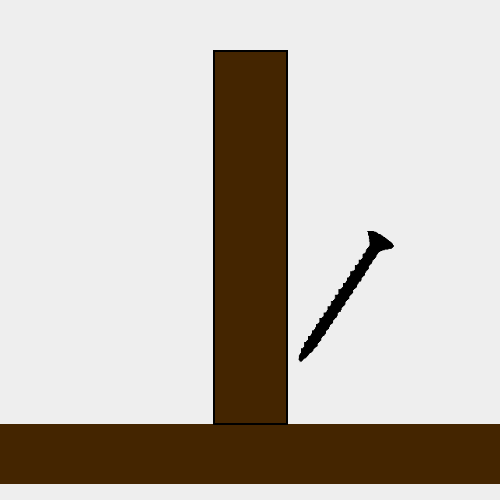 Be mindful of where your deck screws are so that you don’t accidentally drill into them with your bit. With two holes drilled on each end, hammer your 10-inch by 3/8-inch Carriage Bolts into your pre-drilled holes. Now place your 3/8-inch Washers onto the bolts and then use the 3/8-inch Hex Nuts to tighten everything up. Okay. We’ve got one side of girders up! Now do the other side exactly the same way. Once you finish getting both sides bolted and secured, you will be ready to cut your rafters to length. It’s starting to take shape! The hard part is over. 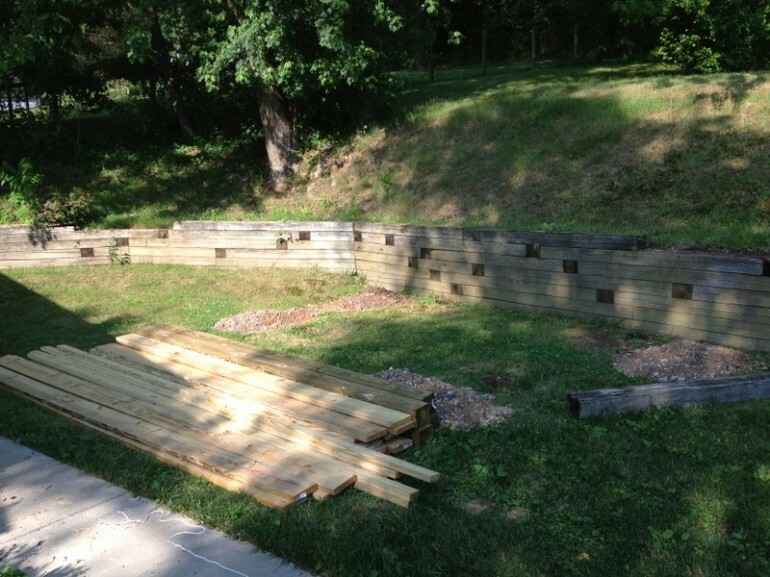 Now we need to cut our rafters to length and make our 45-degree cut on each of their ends. Our rafters are our eleven 2x8x12 boards. This is going to be very similar to how we cut our girders. First, measure from the outside of each beam on the short side of your pergola. This should be roughly 8-foot. 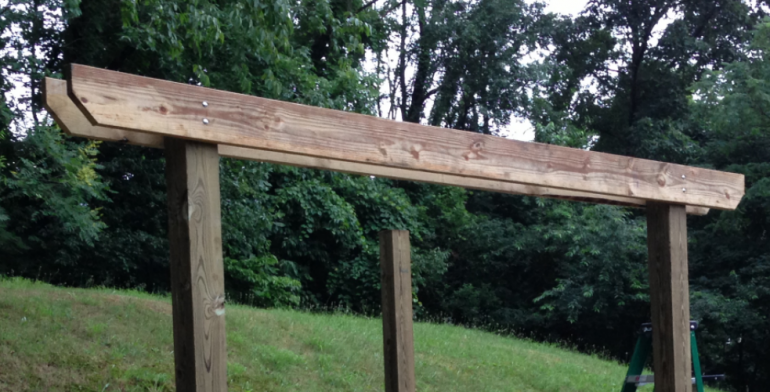 Add 36-inches to this measurement (18-inch overhang for each end). If your measurements were exactly 8-foot then this would make our cuts 11-foot exactly for each rafter. 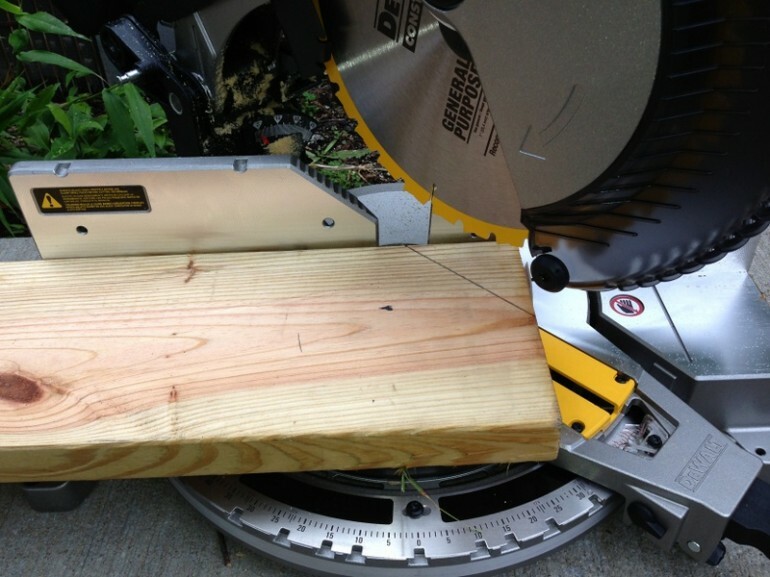 Cut each rafter to length and then make your 45-degree cut to both ends of each board. Again, mark 18-inches in on both ends of each board so we know where to line up our overhangs relative to our girders. You’re now ready to attach your rafters. We will spread our rafters out by 16-inches. Put a mark in at the very center of each girder. From this center mark, we’ll want to measure 8-inches in both directions and mark again. This gives us our first 16-inches on center. From here, continue marking every 16-inches until you reach the edge of the girders. 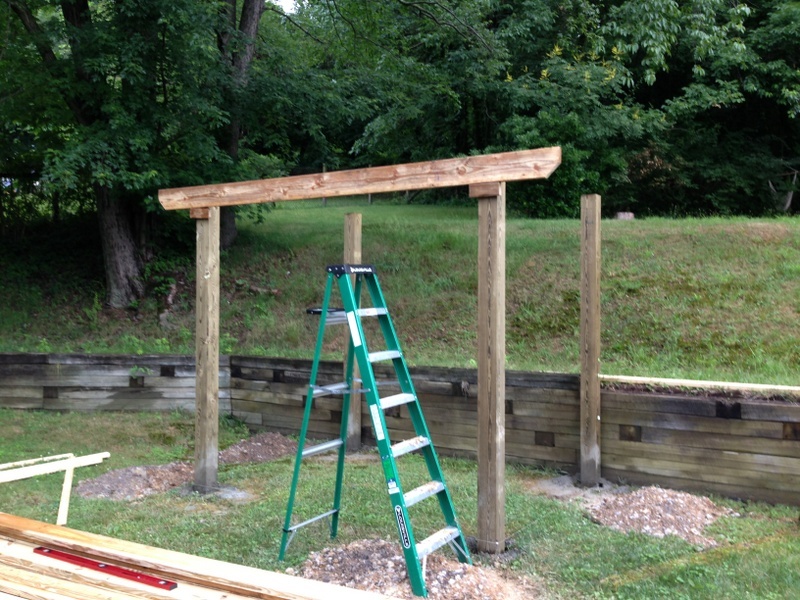 Place your rafters on top of the pergola one board at a time. Maneuver each board until it is lined up with your 16-inch mark on the girder AND the 18-inch marks for your overhang. Once everything is lined up, toe-screw the rafter into all four girders. Once you screw in the last of your rafters, you’re all done! Adding 2x4s is an optional step based on preference. Some people like to screw 2x4s perpendicular to the rafters for a little extra support; however, I enjoy the more open look without the 2x4s attached. 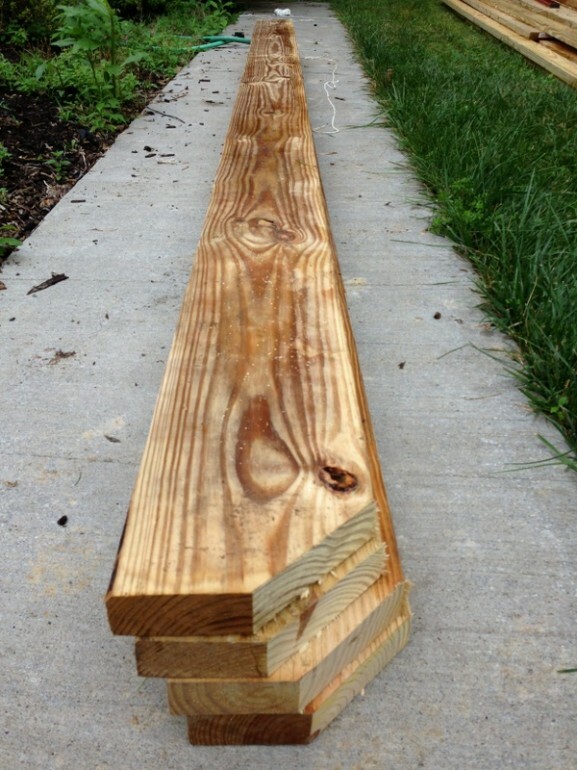 If you would like to attach 2x4s, simply cut them to length (only allow about 2-inches for overhang). Then spread them out every 24-inches from center on top of your rafters. Screw straight down to secure. As I said, in this build I decided to opt out of this optional step. That’s it! You’re all finished up! Now go grab some plants to hang, plan a cookout, and enjoy your new backyard landscape.